The Obama administration is stalling a congressional inquiry into its ongoing refusal to uphold a U.S. law that would sanction Russia for selling advanced missile systems to Iran, according to recent communications between the State Department and Congress exclusively obtained by the Washington Free Beacon. President Obama has the authority under U.S. law to designate as illegal Russia’s recent sale to Iran of the advanced S-300 missile system, a long-range weapon that would boost the Islamic Republic’s military capabilities. The administration has so far declined to exercise its sanction authority under law and has been stalling attempts by Congress to discern the rationale behind this decision, prompting accusations that the administration is ignoring U.S. law and "acquiescing" to the sale in order to preserve last summer’s comprehensive nuclear deal. Rep. Steve Chabot (R., Ohio), who first launched an inquiry challenging the administration’s reluctance to sanction the sale in early April, told the Free Beacon that the White House is continuing to punt questions from lawmakers, jeopardizing efforts by Western nations to block the arms sale. The administration informed Chabot on June 8—more than two months after his initial request—that it has not reached a determination as to whether it will move forward with sanctions as specified under the law. Obama administration officials reiterated this stance when contacted by the Free Beacon late last week. "Frankly, I’m disappointed in the administration’s response to my letter requesting a quick determination that Russia’s transfer of the S-300 missile system to Iran is progressing their efforts to acquire advanced conventional weapons systems," Chabot told the Free Beacon. "Unfortunately, the administration’s abysmal response indicates that they are more than reluctant to provide a determination on this case—which is exceptionally disconcerting considering the administration admits they have been trying to persuade Russia not to proceed with the weapon transfer." U.S. officials continue to avoid specifying whether the president will use current U.S. laws to designate the sale as illicit and place sanctions upon Russia. This power, granted under the Iran-Iraq Arms Nonproliferation Act of 1992, allows the president to sanction any sale of "advanced conventional weapons" to Iran by other nations. Obama administration officials have not explained why the law is still not being followed months after Russia announced it had made good on the multi-million dollar arms sale to Iran. "We regret the delay in responding to your inquiry," the State Department informed Chabot in its most recent communication, according to a copy viewed by the Free Beacon. While the administration remains "concerned" about the S-300 sale, it is not prepared to take action, according to the State Department, which was ordered by the White House to provide Chabot’s office with a response. "We remain concerned about this and have strongly urged Russia not to proceed with the sale of an S-300 system to Iran, as the transfer of these surface-to-air weapons systems to Iran would add to tension in the region and be clearly inconsistent with our common nonproliferation goals," the State Department wrote to Chabot. "The Department will continue to implement, as required, the various sanctions authorities we have to support our non-proliferation priorities," the letter adds. A State Department official further told the Free Beacon it has not yet decided how to react to the sale. 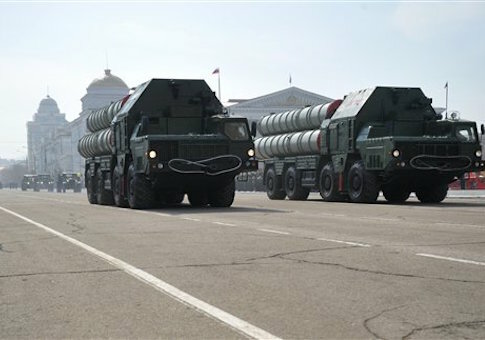 "We're continuing to closely follow reports concerning the delivery of the S-300 missile system from Russia to Iran," said the official, who was not authorized to speak on record. "We have not yet made any determination as to whether this delivery, if and when complete, would trigger any actions under U.S. authorities." Lawmakers, as well as reporters, have been trying for months to obtain answers from the administration about the sale. So far, U.S. officials have declined to provide a rationale as to why the administration has not exercised its sanction authority. "These systems would significantly bolster Iran’s offensive capabilities and introduce new obstacles to our efforts to eliminate the threat of an Iranian nuclear weapon. I believe existing U.S. sanctions should be used to deter Russia from transferring this or other dangerous weapons systems to Iran," Chabot wrote in his initial inquiry to the White House. Obama administration officials are fighting against enforcing U.S. laws designating the sale in order to keep Iran from breaking its commitments under the nuclear agreement, according to one foreign policy adviser who works intimately with Congress on the issue. "The Obama administration seems willing to let Iran get away with anything, up to and including acquiring destabilizing weapons that will remake the military balance in the Middle East, just to preserve the nuclear deal," the source said. "It's difficult to imagine what would ever trigger U.S. action, if importing these missiles that make Iran immune from outside pressure isn't enough. Critics of the Iran deal predicted a lot of this, but the collapse on S-300s is worse than many of them imagined." This entry was posted in National Security and tagged Iran, Iran Nuclear Deal, Russia. Bookmark the permalink.